In another chapter of the Scientists behaving Badly saga the rumblings of lawsuits and congressional probes over the information in leaked emails and files from CRU have begun (via Instapundit). Today, the Competitive Enterprise Institute filed three Notices of Intent to File Suit against NASA and its Goddard Institute for Space Studies (GISS), for those bodies’ refusal — for nearly three years — to provide documents requested under the Freedom of Information Act. I like Scientists Behaving Badly much better than Climategate. We don't really need another X-gate. Although this "gate" is more like the original than some of the other "gates" that have been christened as such. Anyway, here's a round up of facts and opinion on the revelations in the hacked emails and data from University of East Anglia Climatic Research Unit (CRU). Most of these I picked up from Instapundit. Climate cuttings 33, summaries of some of what's in those hacked CRU files. Climategate, Coal Mine Deaths, Air Pollution and Coals assault on human health. I'm not sure I would agree with everything this blogger concludes about coal but this is certainly true, "The over reaching on the science and over aggressive tactics are now blowing up in face of the pro-global warming side." "Democrats Clinch Vote on Health Debate. "In case you want to talk about it. I'll just be over here in a corner curled up in a little ball. This is made all the more amusing to me, in a grim gallows humor kind of way, by the fact that she voted for President Obama. Lets see how much tighter we can cinch up those belts folks! Apparently some place called University of East Anglia Climatic Research Unit got hacked. Their emails and data on global warming climate change are all over the internet. There was initial caution that the data and emails might have been fakes but they have since been confirmed to be the real deal. Why should anyone care about information hacked from the University of East Anglia Climatic Research Unit? Well only because they've apparently been massaging their data to get the desired results with regard to global warming climate change. The desired result being that the planet is warming and that the warming is the fault of mankind. So much for the integrity of the scientific process. There's a post full of updates here, the most amusing of which so far is, "UPDATE VI. The BBC declines to cover this story, preferring a piece on mammoth dung." This is an attention getting essay from Loanna Morrison a black Conservative party candidate in the UK. (Via Booker Rising. )I was struck by her firey and unapologetic defense of her political views. I think much of what she says is also applicable to the current American political scene. Below I've provided a list of American political/cultural discourse equivalents as best I could for those unfamiliar with the Queen's English and British politics. Loanna Morrison: This "ghetto Tory" doesn't care about the social background of the politicians caricatured as "Tory toffs"
I am angered by the constant taunts from the Left that Conservatives are "toffs". Some may be upper class – Eton and all that - but so what? Is it a crime to benefit from a privileged background and a brilliant education as a result of an accident of birth? President Obama brushed off criticism over his administration's inaccurate reporting on job creation Wednesday, telling Fox News the accounting is an "inexact science" and that any errors are a "side issue" when compared with the goal of turning the economy around. He said job growth is his No.1 responsibility. Family, even those who occasionally inspire fantasies of doing them bodily or psychological harm. Everyone who still has a job. This picture sparked a lot of thoughts in my head. My first thoughts were, oh come one not again! Particularly after reading this post's title, Is There a Foregin Potentate Obama Will Not Bow Before? My second thoughts, before looking at the picture, were, it can't really be that bad can it? My third thoughts, after looking at the picture, were, when did we decide to become vassals of the Emperor of Japan? 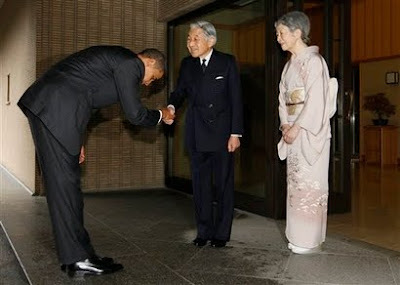 I don't think even the Emperor's own son bows that low to him. My fourth thoughts were, we'll survive this little snafu same as the others. What doesn't kill you makes you stronger right? While we're all moaning and groaning and picking sides in the dust up over this display of ignorance about the significance of bows in Japanese culture has our leader made up his mind yet about how/if he is going to fight the war on terror? The men and women who sacrifice life and limb so the rest of us can live free. The families of those men and women who must soldier on in their absence. The neighbour who, on a day when I'm trying to muster the energy to get off the couch and do something, turns up and my doorstep and asks, "Can I help you clean now?" I got my new glasses. I can see clearly again. The quiet that descends once all of the kids fall asleep. The prayers of righteous men and women.